You can love everything about your favorite couples getaway destination. But after you’ve visited the same spot multiple times, it may start to feel like you’ve done and seen everything the location has to offer. When a destination fits your budget, lifestyle and the amount of time you have, you don’t have to give it up, no matter how many times you’ve been before! So, how can you ensure the fifth (or 15th) visit feels as fun and exciting as the first? Here are six tips for keeping your favorite couples getaway spot feeling fresh and fun, again and again. Trying new accommodations can help give you a fresh perspective. If the two of you usually stay in a standard hotel, consider a bed and breakfast or rental by owner (i.e. Airbnb, VRBO) for the next visit. 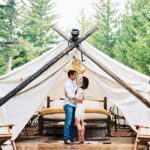 Or, if you’re used to luxury accommodations, try a campground for a different experience; in fact, glamping can be pretty luxurious. Destinations that are popular spots for repeat visitors often have a variety of accommodations as diverse as the travelers who visit. For example, in Myrtle Beach, South Carolina — one of the East Coast’s most popular destinations for repeat visitors — you can find accommodations that range from luxury hotels to budget motels, campgrounds to beach house rentals, all-inclusive resorts to all-suites accommodations. This lodging strategy has worked for the Date Night Guide team time and time again — in St. Augustine, Florida for editor Nancy DeVault and in Asheville, North Carolina for publisher Kristen Manieri. It’s easy to get in a rut when you’re eating on the fly, especially if you’re eating for convenience rather than experience. However, every destination has its own regional cuisine. If you tend to go to fast food or chain restaurants, switch things up by trying an eatery that specializes in regional food. And, if you usually avoid touristy restaurants, try one for the experience next time to see what the fuss is all about. Popular destinations typically have different areas within the region. If you always stay in the same vicinity when visiting your favorite vacation spot, switching to another neighborhood could help you discover new things to see and do. For example, North Myrtle Beach gives visitors easy access to local attractions and beaches but is often quieter and less crowded than the Grand Strand area. Whereas, staying near Broadway at the Beach, one of the city’s shopping and entertainment venues, will be a different experience than staying in a beachfront hotel. Mix it up with new travel companions. No rule says couples vacations can’t (sometimes) include other couples or family. Maybe plan a group getaway with loved ones with whom you don’t normally travel. Visiting a familiar area with new people can help you see it in a new way through their eyes. Plan a different theme each year. Popular destinations rarely have just one type of fun to offer. Make each trip feel new by choosing a theme and engaging in activities that fit that theme. For example, for an adventure-themed itinerary, head to Shark Wake Park for wakeboarding and an aquatic playground and Go Ape Adventures for a zip-lining. For an outdoor theme, try a kayak tour, paddleboard yoga and outdoor seating at Wicked Tuna overlooking the MarshWalk. A cultural theme could include Brookgreen Gardens’ outdoor sculpture gardens and Hopsewee Plantation with high tea. Go at a different time of year. Some places virtually shut down when their high season ends, but others stay vibrant year-round. If your favorite vacation spot has year-round attractions, try visiting in the off-season. Often, hotels and resorts offer great deals to attract travelers during the off-season, plus thinner crowds can mean shorter lines at popular attractions.